Ett par klara-för-sjösättning-bilder från Auckland, New Zealand: en Spray och en lite kortad Spindrift. A quick update from down under with a few pics! Hopefully today you will see a payment for an extra Spindrift that I built this year and gave to my brother. After building it, I felt I didn't want such a long ski, (probably read too many Oscar Chalupski articles) and so I built my ski again at 5.6 meters. I threw it in a local lake before paint and rudder etc to see how she paddled and was surprised how stable and fast she is. She floated perfectly for my weight. My daughters Spray has a finished weight of 11.5 kgs, my shorter Spindrift just under 13.4kgs. Was hoping for a little less, but then again, I didn't go out of my way to shave off the kgs. So, this weekend is official launch day for both these skis although both have spent time in the water already. 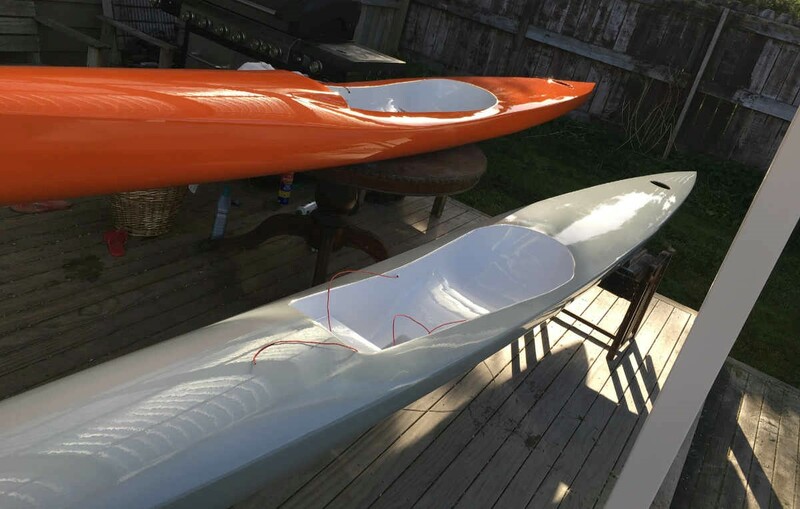 Will send pictures of all three skis in the water. Great work keeping the weight down! 11.5 kg is outstanding for a homemade ski. 13,6 isn't shabby either. One of these days I need to build one. 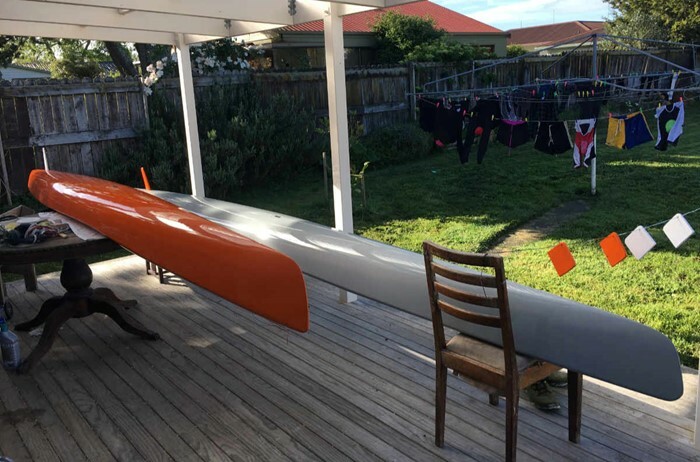 My last kayak-ified "Spray" came in at 36 lbs (16,3 kg) fully outfitted (bare hull weight was about 28 lb or 12,7 kg). Robert, fine work. Looking forward to seeing your photos of your skis in the water. Thanks for your kind comments guys, I've admired your work from afar Dan. To be fair, I shortened my daughters Spray to 5 meters,(she's a dot who doesn't make 4'11" after a stretch in the morning) so there's a bit less boat to weigh than your 5.6 Spray! We are lucky here in NZ too where Paulownia grows like a weed and is lighter than its native Chinese variety. It's a fantastic timber!